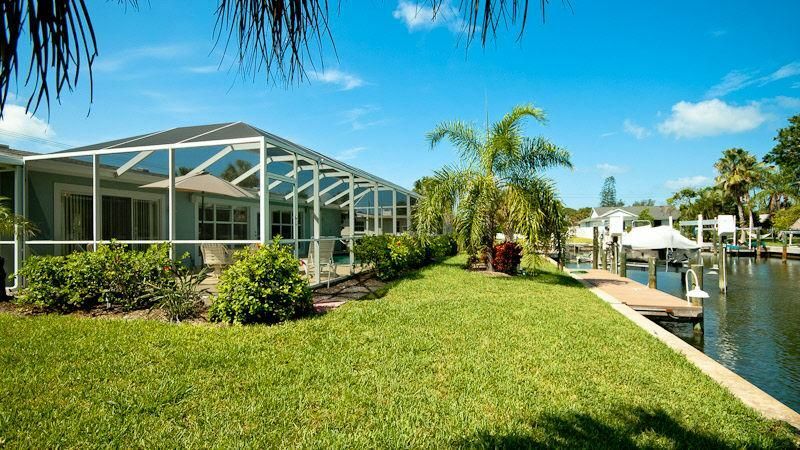 Paradise Found at this Anna Maria Island canal front pool home with private dock. Located just 3 blocks from the beach, this spacious and recently renovated home boasts two master suites and comfortably sleeps eight. Just steps to free island trolley and two blocks from shops and restaurants. Other amenities include heated pool, washer/dryer, Internet, cable TV, DVD, VCR, and outside pool/beach shower. Ideal location and quality furnishings make this your perfect vacation rental! Great beaches, relaxing atmosphere, and close to Tampa. Walking distance to the beach, shops, restaurants, and the island trolley line. A quiet place to enjoy being with your family. Split floor plan with open common area. Two master suites with adjoining bathrooms allowing for more privacy for couples or family vacationing together. 3 blocks from the Ocean. Some board games, books and puzzles. On Great Canal with spot to tie up your Boat, 3 TVs (One in Living Room, and two of the bedrooms), Broadband Internet access for your laptop, all Cooking Utensils and Dishes, Kids Games, Books, Coffeemaker. Our vacation was fantastic. The home was perfect for our family. Plenty of space for everyone. The home was adequately supplied with all the comforts of home. I loved being able to see the children (12, 13 and 14) in the pool from the kitchen or living area. Fishing from the dock was a family favorite. Just a few blocks from the beach with very easy access. Easy to bike ride to Anna Maria for watching the sunset and grabbing ice cream on the way home. Plenty of delicious places to eat on the island or a short drive into Cortez. Pamela was fabulous! We did not want to leave! Already planning for next summer! Perfect house! So comfortable and cute! Great location, quiet but close enough to everything! We really enjoyed the pool and it was just a quick bike ride to the beach. The house had everything we needed for a wonderfully relaxing vacation! We spent 10 days from April 22- May 1 in Paradise Found. The house was clean, lovely, and we especially enjoyed the pool with the screen porch. We appreciated having plenty of beach towels, lovely linens, and comfy beds. It is about a 7 minute walk to the beach for adults. It was wonderful to find 2 new beach chairs and an umbrella there as we had flown to Florida. The location is an easy drive to Pine Street for lots of small shops. There are several great restaurants nearby and the local information in the binder was helpful. There are now 2 queen beds in the house along with a king bed in the master suite rather than a room full of bunk beds as is shown in the picture. Two bunk beds still remain. We would encourage anyone to stay in Paradise Found. The canal offers all sorts of water access as well. It was a perfect 10 days for us! Beautiful property, and very nicely appointed. Great location w dock & pool. Doesn’t get any better. This is such a beautiful property, that we found exactly as described. 3 beautiful bedrooms well appointed with lovely linens. Same with the bathrooms with high quality towels. Kitchen completely outfitted, the beach decor was charming. Truly heated pool, accessible dock that we used daily, fishing in Tampa Bay is excellent. I wouldn’t change a thing about this house. I was envious of the truly comfortable couches, beds, and dining room table and chairs. It’s a much nicer property than the usual rental. If the owner ever wants to sell it please let me know. It was a joy staying there, close to G&J at the IGA, numerous dining, Rod and Reel Pier and sugar sand beaches. The folks on this island are very welcoming of us snow birds who are Island wanna be’s! Just loved everything about our stay here. Everything about this home is wonderful. The moment you walk in the door you know you are somewhere special. Every room in the house is comfortable, clean and inviting. The owner's attention to details is what sets this house apart from so many others and really makes it a home away from home. The location couldn't be better. Take a very short walk to the beach, or shops, and if you'd rather ride, the the bus stop is right there. The heated pool is immaculate and is screen enclosed (which we loved) and the entire area has an open and airy feel. My husband loved being able to dock his boat as the house is on a canal, with easy access to open water for fishing. There are 3 bedrooms and 3 baths, each with plenty of room. Pam, the owner, responds very quickly and is a pleasure to speak with. We loved everything about being here, in every way. House is perfect for my family. Located on a canal with a dock for the boat, it provides quick access to the inter-coastal, Tampa Bay, and the Gulf for the fisherman and a very short walk to the beach for the beach-goers. House is well equipped, tastefully decorated, clean and very comfortable - especially the living room furniture and most importantly, the beds. As soon as you walk in, it gives the ambience of a home and not a "rental property". The pool is temperature controlled which an extremely nice feature as its always refreshing. Pam, the owner, is awesome to deal with and readily available for any questions or concerns you might have.